We are coming upon the 2 year anniversary of the Haunted Family Podcast, I thought since I am procrastinating on editing this weeks episode it is a perfect time to talk to you about starting your own. Every week as we are wrapping up the episode we remind our listeners if they want to start their own to check out Podbean and use our affiliate code hauntedfamilypb. Now you are more than welcome to jump right in and do that. It doesn't cost you anything extra to use our affiliate code (we will get a small percentage for you using our code) but really that isn't fair to just throw our lovely listeners into the water and expect them to swim. So I thought a series of tutorials on everything you need to know to get started in podcasting would be a great idea. This first post is everything you should consider BEFORE you even purchase the first piece of equipment. This is the first post in a series on helping you get your podcast up and going. We made so many mistakes that first year, I want to help you avoid those same pitfalls. Lets start with some basics, have you given these 7 things any thought? They are important. I tried to research before we started, but beyond buy this or buy that, I didn't get many practical advice. 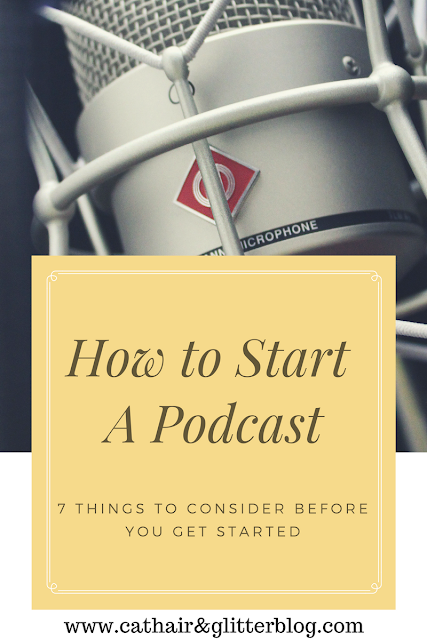 So consider these 7 things and I'll be back with another post (probably in a week) to work through other topics concerning starting your podcast. Will you be recording alone or with a partner? I listen to a lot of podcasts and some have a solo host like Unresolved, The Night Time Podcast, Criminal, and Lore. Some have two hosts like HFP, The Steph and Tara Show, Stories We'd Tell in Bars, Generation Why, and Crime & Stuff. You can also have a a group recording. Its totally up to you but which route you take will have some impact on the "voice" you are portraying. I love the banter of two cohosts, but its absolutely possible to be entertaining with just one host.You should also think about what you will do in the event the cohost can't record or decides to quit. If you are recording with someone how will you be recording? In person or in different locations? Will you have guests? Will they be live guests or pre recorded? All of these are questions you need to have an idea of. Don't worry if you don't know HOW to record in different locations or how to have guests. I will help you through that in a later post...I promise. What's it about? When we started talking about ours. I was driving a lot (I still do but not as much as I was then) I listened to podcasts all day long every day. Mostly true crime. I was a criminology/sociology minor in college. I thought it paired nicely with my BS in Early Childhood Development. Just kidding. I thought it was a topic I was deeply interested in and wanted to learn more about. Its still a topic I am interested in. You want your podcast to be something you are passionate about. Otherwise you will get bored and give up. Once you know what its about search whatever app you listen to podcasts on and determine how popular the topic is. If its something that super popular like True Crime is. How will you stand out? Heather really wanted a paranormal podcast and I really wanted true crime so we compromised. We give listeners a little of both, alternating weeks. What will you call yourself? The name is really important it will be the thing that people remember about you. It should be something memorable, that give the listener an idea what the show is about. Aside from your logo this will be the first thing people see. Heather picked our name and I am still not sure I am in love with it. Her resoning is, Its a podcast about the paranormal, we're family, and our favorite FBI profiler (see so passionate we have a favorite FBI agent) has a book called The Cases That Haunt Us. She had a point so we went with it. What do you want your logo to look like? We recently got a branding makeover. That first year we were so scattered nothing was cohesive. I will help you not make that same mistake. People may tell you not to worry about this right now and to focus on more important things like what you will use to record on.....I say have an idea of what you want your image to look like. Its more important than you may think. Editorial Calendar. This is not a question its a statement. You need one. It will make your life so much easier. In the beginning we just recorded whatever we felt like from week to week. It made us crazy scrambling to research and it and the quality was low. Once we had a list of what topics we were covering and when, things flowed so much better. I hope this has given you some food for thought. Come back next week for help navigating equipment and setup.